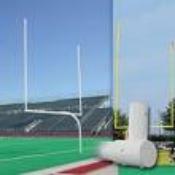 Titan official gooseneck High School Goalposts, Heavy duty...Semi-Permanent... Fully adjustable elbow. NOW easier installation...New adjustable elbow & aluminum uprights on all models make for precise vertical alignment!